19390 Gäste, 1310 Mitglieder online. Here at BUTCHER´S GARAGE, we have been SIP Scootershop customers since day one. 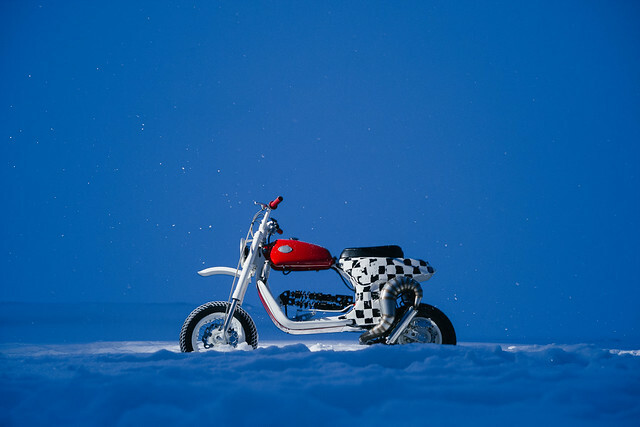 It is no secret, that in Russia, it is often not easy to get hold of things – however for Vespa parts, SIP Scootershop makes life very easy for us. We call the almost 1000 page SIP catalogue “the Bible” in our workshop, only half joking. Due to this long and close collaboration, it was always our dream to work together on a custom project. 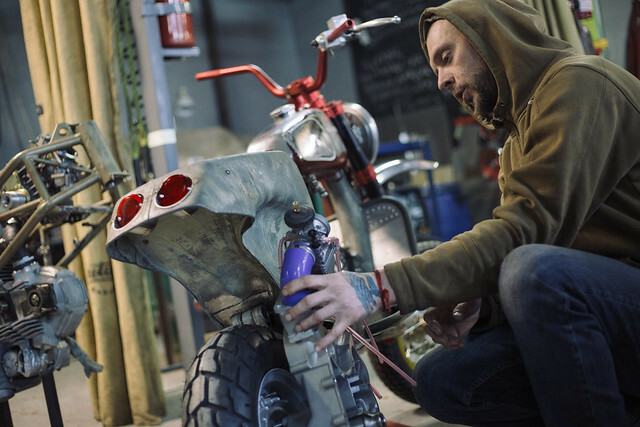 At the moment, we particularly like “scrambler” modifications, which are also a big trend in the motorbike sector. Every motorbike manufacturer now has a scrambler model in the portfolio. We started to investigate whether such a modification would be possible with a classic Vespa. 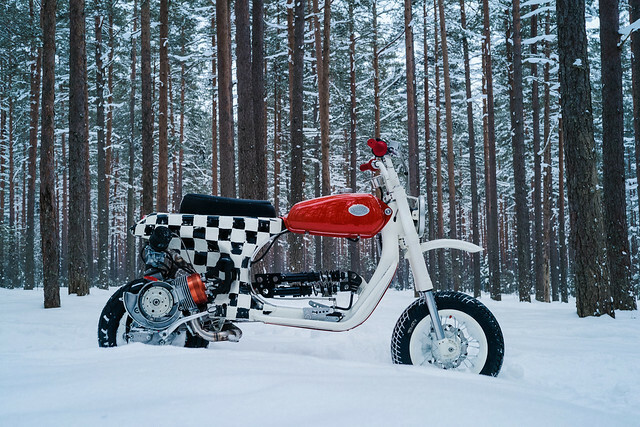 There are already numerous projects with a Vespa base, which were made for cross country or dessert racing. But in our opinion, they were mostly poorly functioning modifications that were only visually impressive. To this end, we decided to combine actual all terrain features with city design, and develop an excellent model to escape from the urban jungle – the idea for project ESC “ESCAPE” was born! We primarily searched for design solutions in the motorbike building of the 60s to 70s: a saddle in the style of the early BSA motorbikes and the tank of the Husqvarna 70, which fitted the PX frame surprisingly well, were a start. The opportunity to build without restrictions or specifications is a big advantage in any work, and the only condition from the SIP boys was to use some of their wonderful products for the project. The people at Metal DIY really helped us with the frame construction. Together, we determined the geometry of the future bike, the wheelbase, the steering column angle, the ground clearance and the height of the saddle, and welded the body parts of the new project. The steering tube for example comes from a pit bike. The rear wheel suspension was laboriously applied to two SIP Performance shock absorbers, which works excellently when riding. Due to the lever of the transmission force on the horizontal plane, based on the pendulum swivel arm of the PX steering column, it was possible to build a system with a central absorption position. The transfer of the shock absorber not only had a good effect on the stroke length and the balance, but also the design, filled the space under the tank and created space for the wide rear wheel, with dimensions of 130/90-10. For the front wheel we used a 12" spoke rim and a custom hub, specially made for use with the Galfer brake disc. The choice of the SIP Performance Curly exhaust should fulfil two functions: better ground clearance and a visual balance between the right and left side of the roller. Our ESC project got fully hydraulic brakes front and rear: a disc brake that we adjusted from SIP Scootershop at the rear, SIP Aluminium CNC brake calliper with large pistons, Galfer brake discs, master brake cylinder and SIP Spiegler braided steel brake hose. 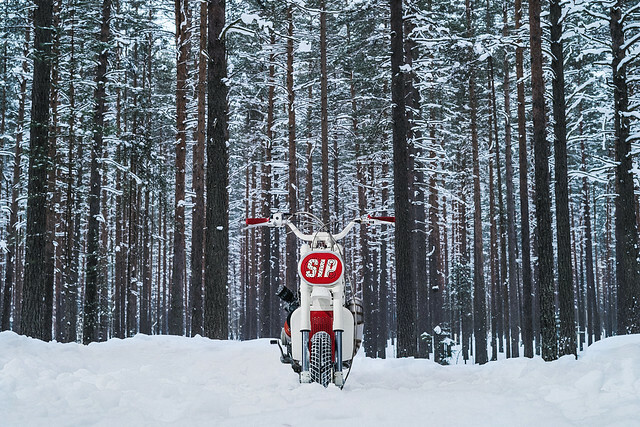 The paintwork in the SIP Scootershop company colours (white, red and black), based on the design of Anton Gorbunov, was carried out by our friend Ksenia Deryagina here in St. Petersburg. In spite of many sketches beforehand, we improved the basic concept several times until we were 100% satisfied. We had the checked part artificially altered, the black squares washed out and covered with acrylic paint, which is why the foundation of the powder coating became cracked. We also slightly modified the tunnel rear lights from SIP Scootershop and welded them onto the rear. According to our concept, the headlight imitates a number plate with sponsor symbols, and is fitted with a high performance LED. We developed and installed a sequential gear box with foot control for maximum similarity to a scrambler motorbike. As a result, the handlebar looks wonderfully light, without additional gear cables or gear selectors. Only the Domino high speed throttle, the adjustable clutch lever and the SIP master brake cylinder, with the handlebar attachment, which we built the emergency stop switch into, remained on the handlebars. The radiator behind the leg shield was handmade by us for this custom modification. 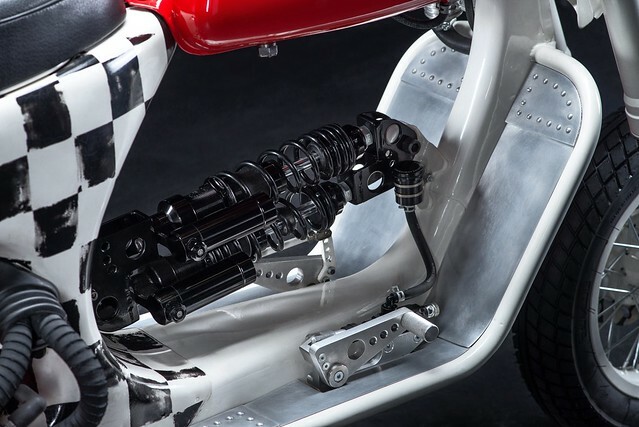 It supplies the water-cooled cylinder head by Parmakit in collaboration with an electric water pump by Malossi.Speed, rotation speed, water temperature and other values are displayed on the SIP tachometer of the Smallframe Vespa. The Custom Scooter has been transferred from Russia to SIP Scootershop in Landsberg and can be visited in the shop! Pictures of the body and the finished scooter here at flickr. Notepad with the most important engine components can be found here.